Nicole Richie is looking AMAZING at the Oscars 2010. Nicole Richie has gone all out Hollywood glamour for the most prestigious awards of the year. Nicole Richie works the most dramatic cat eye at the Oscars, I LOVE IT! Nicole Richie looks beautiful in a beaded metallic gown. Nicole Richie's Oscar outfit was styled by Simone Harouche. Nicole is wearing a dress by Reem Acra and her jewels are by Lorraine Schwartz. Nicole Richie and actress Vera Farmiga. Is anyone else feeling 'Jennifer Lopez' in Nicole's Oscar look?! 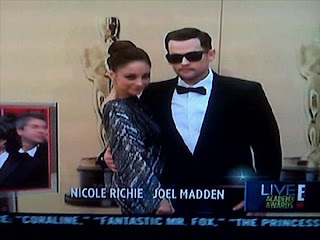 Screencap of Nicole Richie and Joel Madden on E! What do you think of Nicole's Oscars outfit? wish i could pull something like that off. I'm not sure if I'm in love with the dress but she does look stunning. I thought I would let you know incase you didn't that the silk peacock jacket Nicole wore a couple of weeks ago to an unknown party is from her collection!